In 2012, Uganda was propelled into the international spotlight following a viral video and online campaign #Kony2012. It called for US intervention and global attention to the war crimes and child soldiers of Joseph Kony, leader of the Lord’s Resistance Army (LRA). Five years later, LRA forces have receded and global attention on Uganda has dissipated. But what has been done about the inter-tribal and inter-religious conflict and gender-based violence that has plagued the country since the retreat of colonialism in the 1960s? Uganda is home to a plethora of coexisting ethnic groups and religions. However, the presence of conflicting tribal, ethnic, and religious identities is ripe for violence and Uganda is plagued by armed conflict between hostile ethnic and religious groups. Moreover, tension between rebel groups and government forces destabilises the political situation in Uganda. The LRA alone has abducted 30,000 children and displaced 1.6 million Ugandans from the North – leaving them as Internally Displaced Persons, or refugees within their own country. This violence has impacted young people in schools as well. Uganda faces high rates of teachers assaulting their students and children bullying their classmates. Uganda became a republic in 1963, under Milton Obote, but this republic was short lived as power was seized and the constitution was amended to give the president additional powers. Uganda’s term as a republic came to an end when Idi Amin, the army chief, toppled President Obote in a coup. Although Milton Obote’s presidency oversaw Uganda’s turn into a police state, Idi Amin’s dictatorship took the brutality to new extremes, especially through his use of ethnic and tribal discrimination. For example, he supervised the massacres and targeting of Langi and Acholi soldiers, who were loyal to Obote, beginning with the 1971 massacres at the Jinja and Mbarara Barracks. As a devout Muslim and member of the Kakwa tribe, he also surrounded himself in both the civil service and higher ranks of the military with Muslim and Kakwa tribesmen. Idi Amin’s dictatorship was characterised by militarism, the excessive use of brute force and violence in the name of what Amin believed to be the national interest. His regime used disappearances, kidnappings, extrajudicial murders, and sexual assault to impose his rule on Ugandan citizens, resulting in approximately 300,000 deaths. The origins of gender-based violence in present-day Uganda lie in its violent past. Idi Amin cultivated a hyper-masculine personality and entrusted the well-being of the nation to the military. Through militarism, the masculinity constructed in Uganda reemphasized gender roles, giving free reign for soldiers and police to violently impose their will on citizens, both in the home and the country at large. Today, this gender-based violence is rooted in conflicts that are often tribal or ethnic in nature. Uganda faces sustained clashes between militant groups and government forces, with innocent bystanders becoming victims of sexual and gender-based violence. According to a report conducted by the Justice and Reconciliation Project, factors that worsen this type of violence in post-conflict situations include “family dissolutions, loss of livelihoods, and wartime trauma”. Moreover, the poor economic situation in Northern Uganda has left men without jobs, initiating a ‘crisis of masculinity’, and creating problems with alcoholism and sexual violence. In 2011, it was reported that 56% of women aged 15-49 have experienced physical violence at least once since the age of 15, and 28% have experienced sexual violence. What is the State of Uganda Today? Through a coup, Idi Amin was toppled as dictator and the forces instated Milton Obote as president. In his second stint as president, Milton Obote faced guerrilla war led by opposition leader Yoweri Museveni and his term was characterised by chaos, poor economic growth, and more tribal violence. Yoweri has been president of Uganda since 1986 when his supporters toppled Obote’s regime in a coup. Since 1990, the Ugandan government has been battling the Lord’s Resistance Army, an armed group accused of war crimes and crimes against humanity, seeking the establishment of a sovereign state governed by an interpretation of the biblical 10 commandments. However, LRA forces have been reduced to approximately 120 men and forced out of Uganda, and although his group continues to terrorise parts of Central African Republic and South Sudan, Ugandan military forces have ceased their campaign against the LRA. Although the LRA have now left, the crisis in the north has sown terror and displacement in communities across northern Uganda, increasing tensions between ethnic groups and creating land rights disputes. Armed conflict between other militant groups both in and around Uganda has increased the number of refugees in Uganda as well. There are about 800,000 refugees from South Sudan increasing the strain on Uganda’s infrastructure and resources and increasing security risks. The tensions between ethnic groups and religious groups are noticeable amongst youth and children in schools, often resulting in physical violence between students. 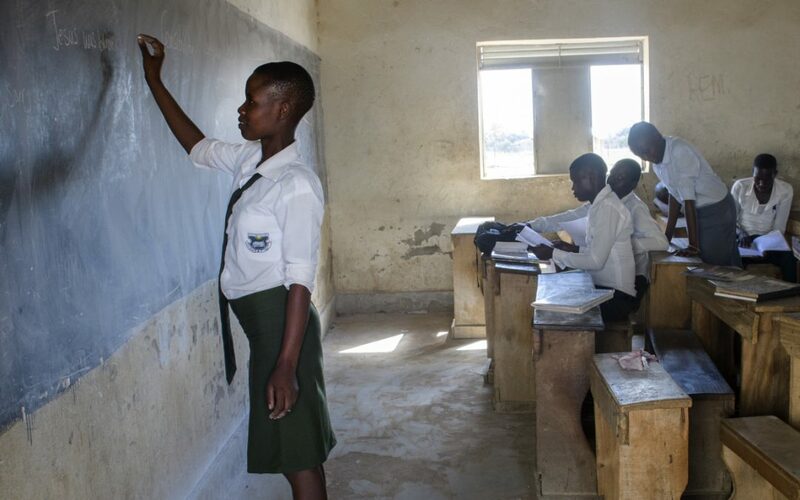 Youth in Uganda also face high rates of sexual violence: a survey commissioned by the Ministry of Education and Sports states that 82% of secondary school students and 77% of primary school students have been subjected to sexual abuse. Generations For Peace (GFP) has been working in Uganda since 2014, mainly in the Soroti region of eastern Uganda, through a Sport For Peace programme addressing the challenges of inter-tribal, inter-ethnic, and inter-religious violence. To date, activities have provided opportunities for regular communication through which participants have shared their thoughts and opinions with one another. Over time, this has strengthened trust, respect and understanding. It has also shown a willingness of all to work towards a common goal as one group, as Ugandans. GFP hopes to start a programme in the future addressing the challenges put forth by gender-based discrimination and violence amongst youth.